This is a little note about constructing a Riemannian 2-sphere which has longer shortest geodesic than the round 2-sphere of same area. So there has been this thing called ‘mathematical conversations’ at the IAS, which involves someone present a topic that’s elementary enough to be accessible to mathematicians in all fields and yet can be expanded in different directions and lead into interesting interdisciplinary discussions. Nancy Hingston gave one of those conversations about simple geodesics on the two-sphere one night and I was (thanks to Maria Trnkova who dragged me in) able to attend. So she talked about some fascinating history of proving the existence of closed geodesics and later simple closed geodesics on generic Riemannian two-spheres. Something about this talk obviously touched my ‘systolic nerve’, so when the discussion session came up I asked whether we have bounds on ‘length of longest possible shortest closed geodesic on a sphere with unit area’. The question seem to have generated some interest in the audience and resulted in a back-and-forth discussion (some of which I had no clue what they were talking about). So the conclusion was at least nobody knows such a result on top of their head and perhaps optimum is obtained by the round sphere. Well that’s pretty nice, so I went home and did a little high-school computations. The difficulty about the pillow is that the shortest geodesic isn’t necessarily the one that goes through the ‘tip’ and ‘mid-point of the base’, something else might be shorter. I have no idea how to argue that. Okay, now the situation is super simple~ I want to prove that this ‘sphere’ (let’s call it from now on) has shortest geodesic longer than the round sphere ( )! Of course we suppose both and has area 1. 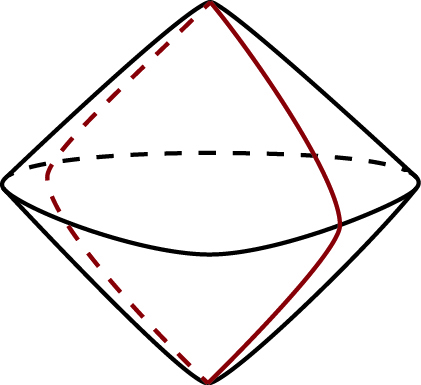 Proof: The shortest closed geodesic passing through the corner is the one described above, since any other such geodesics must contain two symmetric segments from the corner to the bottom edge on the two triangles, those two segments alone is longer than the one orthogonal to the edge. First we observe any closed geodesic not passing through the corner is a periodical billiard path in the triangular table with even period. So let’s ‘unfold’ the triangles on the plane. 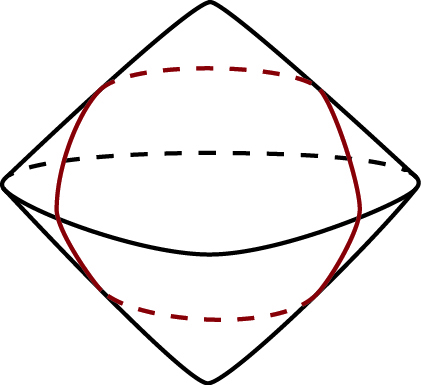 Such periodic orbits correspond to connecting two corresponding points on a pair of identified parallel edges and the segment between them intersecting an even number of tiles. 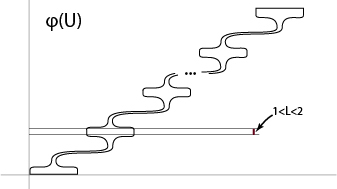 Hence we conclude there are no shorter periodic billiard paths, i.e. 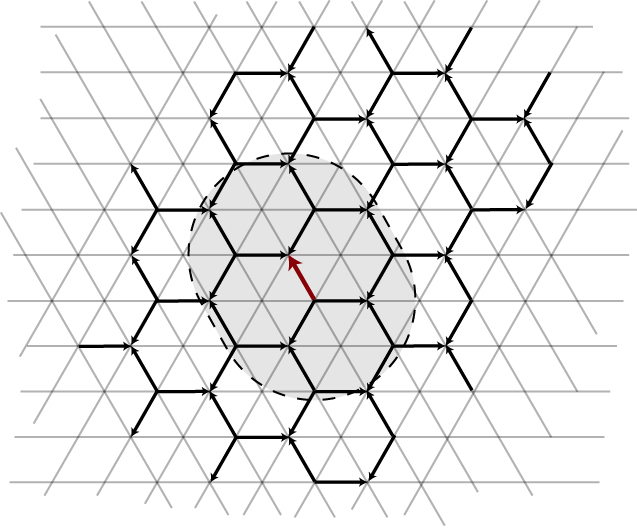 the shortest closed geodesic on has length . Note it’s curious that there are a huge amount of closed geodesics of that particular length, most of them are not even simple! However it seems that after we smoothen to a Riemannian metric, the non-simple ones all become a little longer than that simple one through the corner. I wonder if it’s possible that on a Riemannian sphere the shortest closed geodesic is a non-simple one. Any closed geodesics is a multiple of a great circle, hence the shortest geodesic has length , which is just slightly shorter than . Now the natural question arises: if the round sphere is not optimum, then what is the optimum? At this point I looked into the literature a little bit, turns out this problem is quite well-studied and there is a conjecture by Christopher Croke that the optimum is exactly . (Of course this optimum is achieved by our singular triangle metric hence after smoothing it would be . Random remark: The essential difference between this and the systolic questions is that the sphere is simply connected. So the usual starting point, namely ‘lift to universal cover’ for attacking systolic questions does not work. There is also the essential difference where, for example, the question I addressed above regarding whether the shortest geodesic is simple would not exist in systolic situation since we can always split the curve into two pieces and tighten them up, at least one would still be homotopically non-trivial. In conclusion since this question sees no topology but only the geometry of the metric, I find it interesting in its own way. The goal for most of the posts in this blog has been to take out some very simple parts of certain papers/subjects and “blow them up” to a point where anybody (myself included) can understand. Ideally the simple parts should give some inspirations and ideas towards the more general subject. This one is on the same vein. This one is based on parts of professor Guth’s minimax paper. In an earlier post, we talked about the extremal length where one is able to bound the “largest possible minimum length” (i.e. the “maximum minimum length“) of a family of rectifiable curves under conformal transformation. When combined with the uniformization theorem in for surfaces, this becomes a powerful tool for understanding arbitrary Riemannian metrics (and for conformal classes of metrics in higher dimensions). Question: Let be the unit disc. Given any family of arcs with endpoints on and foliates , then how short can the logest arc in possibly be? Proof: Consider the map where , switches the end-points of each arc in . It is easy to check that is a continuous, orientation reversing homeomorphism of the circle (conjugate to a reflection). Let be its fixed points, be the two arcs in connecting to . be the antipodal map on . Suppose then one of is longer than , say it’s . Hence has a fixed point in , i.e. . The remaining case is trivial: if then both and gets mapped into themselves orientation-reversingly, hence fixed points still exists. Theorem: Any one-parameter family of circles that foliates (except two points) must have the largest circle being longer than the equator. This is merely applying the same argument, i.e. one of the circles needs to contain a pair of antipodal points hence must be longer than the equator. Theorem: For any having non-zero degree, there is where is larger than the equator. Theorem: Let be equipped with the round metric. be a ‘flat’ -dimensional plane. Then any -chain in the same dimensional homology class as must have volume at least as large as . Proof: Let be the set of all -planes in (i.e. the Grassmannian). Let be the Haar measure on , fix some . –The measure of a collection of planes is the measure of linear transformations that takes the given plane to an element of the set. Now we are able to integrate over all -planes! Since in , for almost all , intersects at least as much as does. We conclude that for almost all . The fact is obtained by diving the chain into fine cubes, observe that both volume and expectation are additive and translation invariant. Therefore we only need to show this for infinitesimal cubes (or balls) near . We won’t work out the details here. Hence in our case, since for almost all we have , the expectation . Remark: I found this intergal geometry method used here being very handy: in the old days I always try to give lower bounds on volume of stuff by intersecting it with planes and then pretend the ‘stuff’ were orthogonal to the plane, which is the worst case in terms of having small volume. An example of such bound can be found in the knot distorsion post where in order to lower bound the length we look at its intersection number with a family of parallel planes and then integrate the intersection. This is like looking from one particular direction and record how many times did a curve go through each height, of course one would never get the exact length if we know the curve already. What if we are allowed to look from all directions? I always wondered if we know the intersection number with not only a set of parallel planes but planes in all directions, then are there anything we can do to better bound the volume? 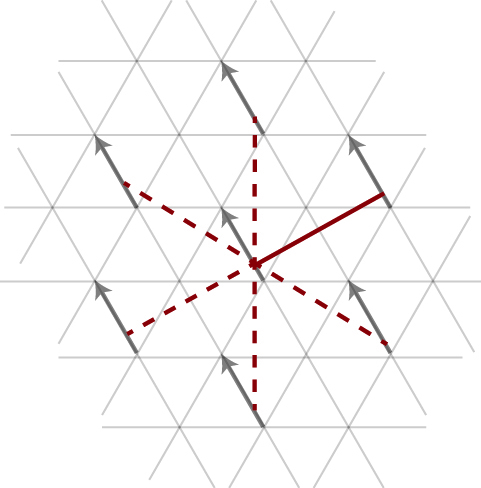 Here I found the perfect answer to my question: by integrating over the Grassmannian, we are able to get the exact volume from how much it intersect each plane! Corollary: where carries the round metric with total volume . where is the -dimensional equator. There has been a couple of interesting talks recently here at Princeton. Somehow the term ‘extremal length’ came up in all of them. Due to my vast ignorance, I knew nothing about this before, but it sounded cool (and even somewhat systolic); hence I looked a little bit into that and would like to say a few words about it here. One can find a rigorous exposition on extremal length in the book Quasiconformal mappings in the plane. Call this metric on and denote metric space . Let be the set of conformal factors with norm (i.e. having the total volume of normalized to ). Remark: In fact I think it would be more natural to just use instead of since it’s called a “length”…but since the standard notion is to sup over all , not necessarily normalized, and having the -width squared divide by the volume of , I can’t use conflicting notation. One should note that in our case it’s just the square of sup of width. Definition:The metric where this extremal is achieved is called an extremal metric for the family . It’s easy to see that (merely change of variables). In the same way, for any rectifiable curve. Theorem: Let , be the set of all curves starting at a point in the left edge , ending on with finite length. Then and the Euclidean metric is an extremal metric. Since the shortest curve cannot be longer than the average curve, we have . Note it’s almost the same argument as in the proof of systolic inequality on the 2-torus. Corollary: Rectangles with different eccentricity are not conformally equivalent (i.e. 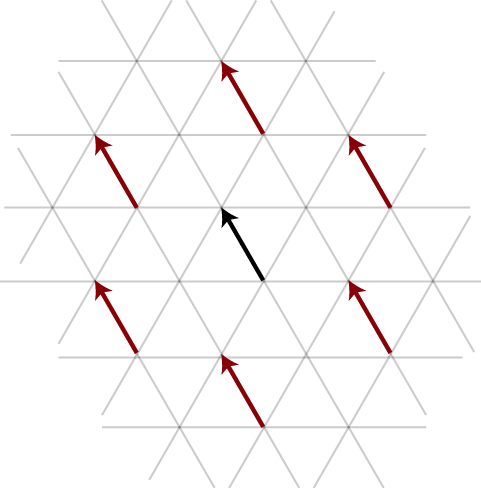 one cannot find a bi-homomorphic map between them sending each edge to an edge). 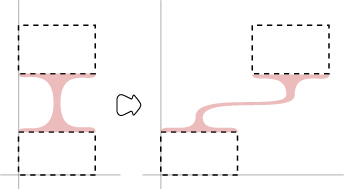 Remark: I was not aware of this a few days ago and somehow had the silly thought that there are conformal maps between any pair of rectangles while discussing with Guangbo >.< then tried to see what would those maps look like and was of course not able to do so. (there are obviously Riemann maps between the rectangles, but they don't send conners to conners, i.e. can't be extended to a conformal map on the closed rectangle). An add-on: While I came across a paper of Odes Schramm, applying the techniques of extremal length, the following theorem seemed really cool. Let be a finite planar graph with vertex set and edges . For each vertex we assign a simply connected domain . Theorem: We can scale and translate each to so that form a packing (i.e. are disjoint) and the contact graph of is . (i.e. iff . Note: This is vastly stronger than producing a circle packing with prescribed structure. Theorem: If is an open set in the plane with area , then there is a continuous function from to the reals, so that each level set of has length at most . Question: Let be a Riemannian metric on the torus with total volume , does there always exist a function s.t. each level set of has length at most ? Proof: Note that if a projection of in any direction has length (one-dimensional measure) , then by taking to be the projection in the orthogonal direction, all level sets are straight with length (see image below). Now we define a that straches the neck to fit in a long thin tube (note that in general may not be connected, but everything is still well-defined and the argument does go through.) and then bend the neck to make the top chunk vertically disjoint from the bottom chunk. We can take so that sends the vertical foliation of to the following foliation in (note that here we drew the neck wider for easier viewing, in fact the horizontal lines are VERY dense in the neck). Where each chunk has -width between and . The total length of is less than (length of on the vertical segment) (length of on each horizontal segment). Pick both less than , we conclude . Remark:More generally,any open set of volume has such function with fibers having length . 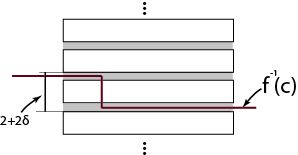 T he argument generalizes by looking at the middle set length set of each chunk. Now let’s look at the problem on , by the uniformization theorem we have a flat torus where is a lattice, and a function s.t. is isometric to . is the flat metric. Hence we only need to find a map on with short fibers. 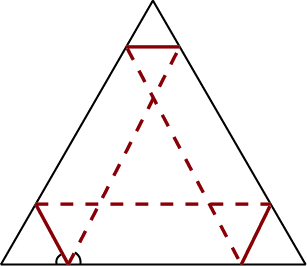 Consider as the parallelogram given by with sides identified. w.l.o.g. assume one side is parallel to the -axis. Let be a linear transformation preserving the horizontal foliation and sends the parallelogram to a rectangle. Since all corresponding edges are identified, $lates F$ is continuous not only on the rectangle but on the rectangular torus. 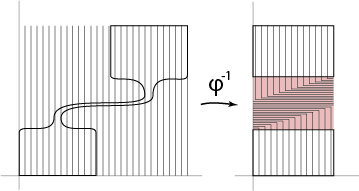 Note that vertical loops might be very long in the flat due to the shear while the horizontal is always the width.